Oscar Martinez's poem "The Words To Say I Love You". music: from Claude Debussy's Children's Corner by Bela Fleck from Perpetual Motion on Sony Classical. Pradipti Lama reads the end credits. I just can’t wait to say it. I dance in the clouds all day long. Make my heart come out of my chest. This means that you’re the best. When I feel lonely I’m actually not! on and day in anyway. I’m just saying I love you. And in my mind you’ll stay. Especially when I’m with you! Oscar Martinez is a student at San Francisco's E.R.Taylor Elementary School, where he writes poetry and plays soccer as part of the AmericaSCORES program. 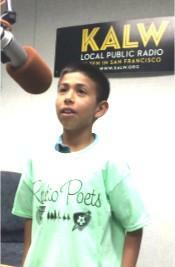 KALW is proud to bring his voice to the air during National Poetry Month. just jump in the puddles all day. that’s how you made a mash.